SALT LAKE CITY (AP) — Restaurant owners may no longer have to post signs declaring they aren’t bars, but bar owners will still have to tell customers they are bars, if a revision to regulations enacted last year gets lawmaker approval. Welcome to Utah, known for its strict liquor laws and an elaborate set of rules that often leaves visitors puzzled. Rep. Brad Wilson proposed Thursday to lift a requirement that restaurants post 8.5-by-11-inch signs declaring they are establishments that serve food. 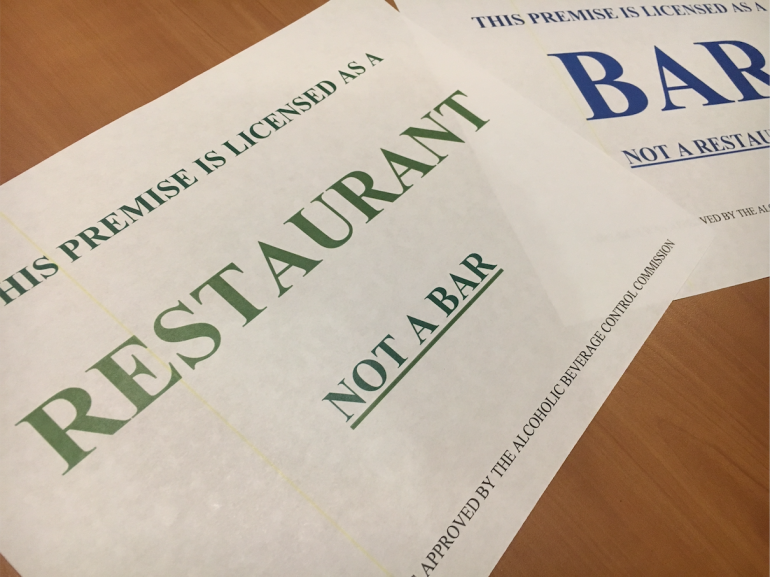 But the Kaysville Republican’s legislation leaves in place a requirement for bars to post signs although they will no longer have to say they aren’t restaurants. The proposal, which includes other changes to liquor laws, has yet to be debated by lawmakers. It was referred to the House Business and Labor Committee Friday. Melva Sine, president of the Utah Restaurant Association, said restaurant owners are quite happy about the prospect of being able to take down signs that befuddled tourists and newcomers. Wilson acknowledged that he understands the industry’s complaints. David Morris, president of the Utah Hospitality Association, which represents 56 bars in the state, said the current signs for bars create confusion for customers because some bars serve food. He’s always had signs at the four bars he owns that explain the bars are only open to people 21 and older, he said; his bars also serve food, which brings in about 40 percent of his revenue. Michele Corigliano, executive director of the Salt Lake Area Restaurant Association, said residents have had fun mocking the signs. But she said it wasn’t funny for perplexed visitors left with the impression they couldn’t get a beer or glass of wine at a restaurant. “It’s another thing that makes us stick out like a sore thumb,” said Corigliano about the signs. Utah’s strict liquor laws are driven by the state’s dominant religion, the Mormon church, which says the state’s laws are reasonable and effectively curtail binge and underage drinking and DUIs while still allowing people to drink responsibly. Members of The Church of Jesus Christ of Latter-day Saints are taught not to drink alcohol. Church spokesman Eric Hawkins said the religion doesn’t oppose the bill as written. Written by BRADY McCOMBS, Associated Press. AP writer Michelle L. Price contributed to this report. Included photos courtesy of Fox13Now.com from an April 25, 2017, report by Ben Winslow on the subject matter. Content copyright 2018 The Associated Press (photos excluded). All rights reserved. This material may not be published, broadcast, rewritten or redistributed. Photos copyright 2017, KSTU. A Tribune broadcasting station. All rights reserved. This material may not be published, broadcast, rewritten or redistributed. Some of the biggest BoozeHounds are LDS Bishops and Stake Presidents! Who are you kidding???? We even have Drug Dealers in the Church!